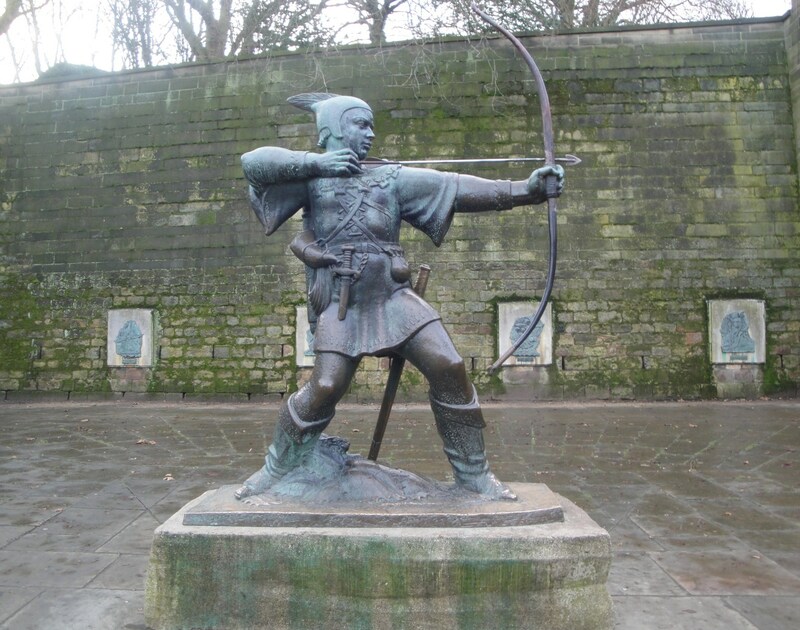 Fothergills is located right next to the famous Robin Hood Statue just below the main entrance to Nottingham Castle at 5-7 Castle Road. 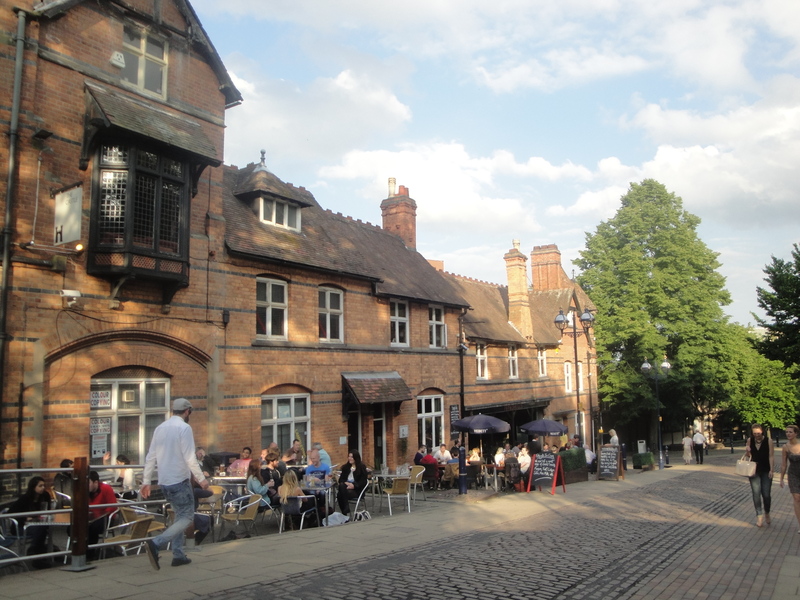 As you sit in the bar or on the outside patio you can see the statue with his bowed arm across the cobbled stoned road in the courtyard beneath the Castle Walls. When the sun is shining or even threatening to shine they open up the front window of the restaurant and bar which effectively extends the outside space so that you can sit outside while inside on one of their comfortable leather couches. When it is nice weather there can be few better spots in the city to catch the late rays of the sun, imbibe on a cold beer and perhaps sample a small morsel of sustenance. We walked over to the Castle Grounds with the intention of joining the ‘beautiful people’ on the Fothergills Terrace for a beer and some food. When we arrived I felt somewhat underdressed for the patio, but dressed well enough to order up a couple of pints of Sunchaser Beer, grab a couple of menus, and claim a table inside next to the bar. I was very tempted by the possibility of a plateful of the ‘Slow Roasted Belly Pork’ for £11.50 described on the menu as “Tender local pork and crispy crackling, buttered cabbage and bacon, crushed new potatoes and cider cream sauce”. It was then pointed out to me by my erstwhile dining companion Martin that I always order Pork belly or Pulled Pork these days (which is half true). I kindly didn’t point out that he nearly always orders some sort of burger (On this occasion he was to order the Gourmet Lamb Burger). 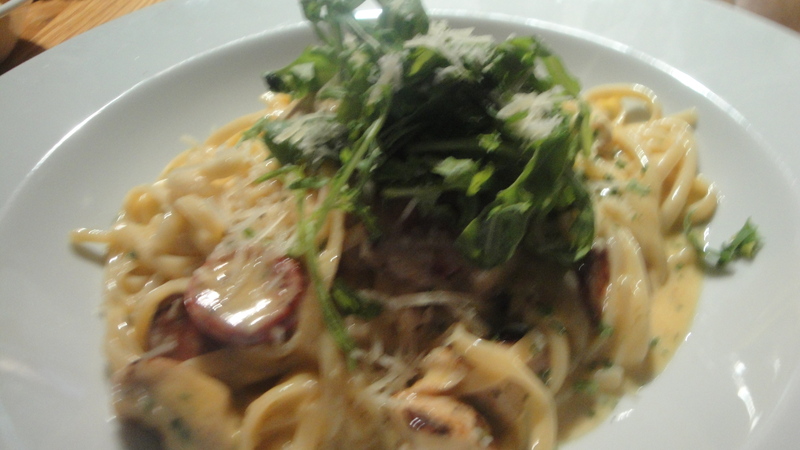 I continued to peruse through the plentiful options on the menu and eventually settled upon the ‘Chicken & Chorizo Linguine’ for £10.95 which was described as “Chicken and spicy Spanish sausage with ribbons of pasta, white wine, cream and fresh herbs with dressed rocket leaves and Parmesan“. It came as described, very simply presented in a deceptively large bowl. On first inspection there did not seem to be much in there, but it was quite a deep bowl and there was plenty of chicken and chorizo folded in between those ‘ribbons’ of pasta. The sauce was nice and creamy, not too rich. The peppery rocket on the top was quite a nice touch and something a little different. I enjoyed it and I would eat this dish again if I came back to Fothergills to dine. 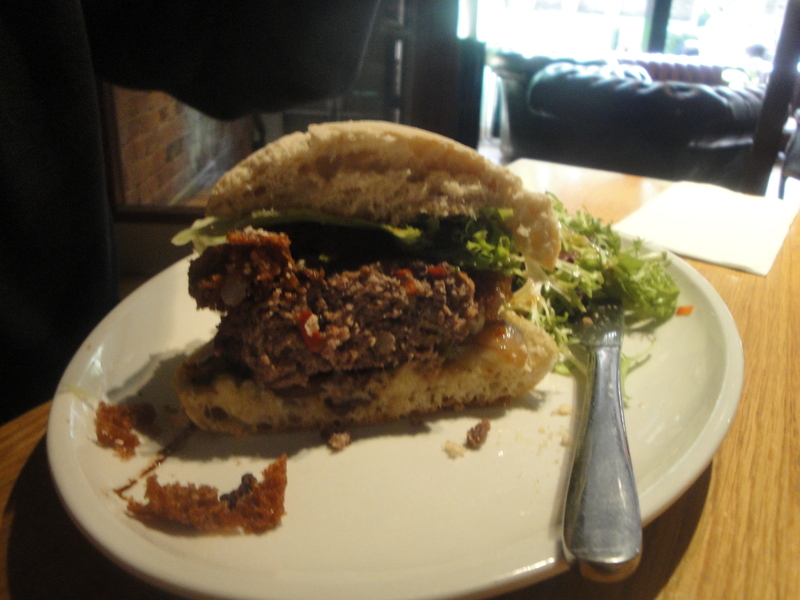 The other dish we had ordered (well Martin did) was that Gourmet Lamb Burger for £9.95. This was described as being “Served in our rustic roll with marinated cherry tomatoes, mint yoghurt, rocket and olives with onion rings, homemade salsa, mixed salad and rustic chips“. 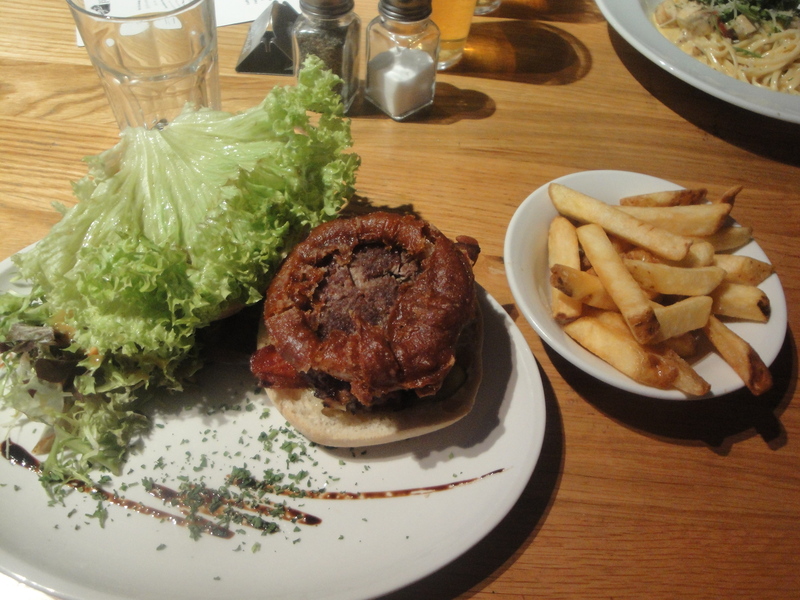 The mixed salad seemed to be a huge leaf of lettuce and the onion ring seemed to be a bit over crispy. The overall verdict was that the meat patty was quite nicely spiced and was still juicy but the ‘rustic’ roll was perhaps not the best bread for the burger. That’s a tricky one as I suppose using this type of roll is done to make the sandwich a little different from just your average pub burger. Having said that you can sometimes go too far as with a burger it is all about the combined bite and taste and you can’t always expect a great bun and a great meat patty to combine to make a great burger. I think it just about all worked together though as there was nothing left at the end and the glimmers of a contented smile emerging in between sips of beer. On another occasion I quite fancy popping up here for a sandwich and a beer one lunchtime. They had plenty on the lunch menu that I fancied trying, in particular the “Oak Smoked Salmon”, and the “Roast Belly Pork & Apple”. You can see the full menu on their website.